LNL Machine Tools, Inc. offers machine tool sales and field service for CNC vertical and horizontal machining centers, CNC turning centers, lathes, mills and other cost-effective machining solutions requiring high speed, high precision for today's demanding industries. LNL Machine Tools is a distributor for superior brand names, Clausing, Romi and Tong-Tai. Featured on this web site is just a small sampling of new machine tools that are available for sale. Please contact us for your exact machine tool requirements and we will be happy to provide the specific solutions you are looking for. 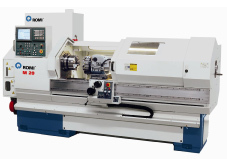 At LNL Machine Tools, we also have used machine tools available for sale, and occasionally run showroom specials for additional great savings... check this site often! Located in Lancaster County PA, we focus our field service to the Tri-State area (PA, NJ, MD). For geographical areas beyond this region, contact us to discuss possibilities. We also offer parts and accessories for Supermax, KIWA and many other machine tools, as well as D.R.O. 's, barfeeds, chucks, tooling and many other accessories. Please don't hesitate to call (717-336-0977) or email us so we can assist you in finding trouble-free machine tools offering heavy metal removal and fine precision machining and finishing for your specific industrial needs.